DEARBORN, MI – The Ford Fleet Product and Business Conference was held June 21 - 23 in Dearborn, Mich. at Ford's Dearborn Product Development Center. This event was a chance for fleet managers to see Ford’s latest vehicles and get more insight into Ford's fleet-related operations. The event started with a business meeting and reception at the Detroit Institute of Arts on day one, where the automaker provided an overview of its fleet business. Day two featured the ride and drive event and a customer reception at Greenfield Village. 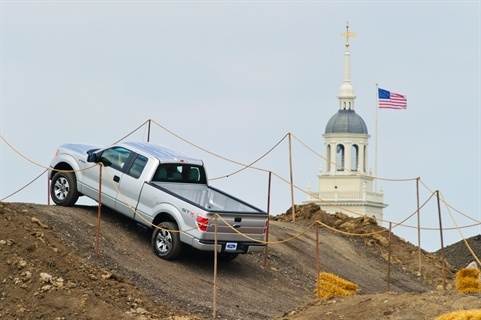 The event featured a range of different opportunities for attendees to drive Ford vehicles, including an off-road course for driving the Explorer and F-150, a Transit Connect City Drive, and a full-line street drive, among others. You can see photos from the event in our gallery here. Automotive Fleet spoke with a number of fleet managers who attended about their impressions of the event and the vehicles they had a chance to drive. Brenda Davis, commodity manager, fleet COE & temporary services for Baker Hughes, said the event provided an opportunity to meet Ford’s executive leadership and support team. Kim LaRue, fleet operations manager for Goodman Networks, said the event provided her with a positive impression of Ford’s management and their dedication to the fleet industry. Guy H. Young, VP - fleet services for Western Exterminator Company was impressed with the company’s dedication to its fleet customers as well. Davis said she was impressed with the F-150 equipped with the EcoBoost engine and had the opportunity to drive it on the test track, in addition to other vehicles used every day in her company’s fleet. Don Yegan, fleet manager for Stantec, an architecture, engineering, and design consulting firm, gave his impressions of a couple of different vehicles, the Transit Connect Electric and the F-150. Yegan also had good things to say about the Transit Connect Electric. LaRue said she thought it was a good event overall and that she appreciated the chance to drive the F-150 on off-road terrain given its use at her company. Ray Haering, acquisition specialist at Florida Power & Light, said he was most impressed with the overall performance of Ford’s EcoBoost engine in the F-150, adding that it was quick off the line. He was also impressed with the 2012 Focus’ smooth handling and its NVH characteristics. Young with Western Exterminator Company was also impressed with the power the EcoBoost can produce, especially when compared to previous V-8 models. For Stephanie Rogers, vehicle program administrator for Allergan, this was her first time attending the Ford Fleet Product & Business Conference. Rogers said she had the opportunity to drive a number of vehicles at the event, including the Flex, Edge, Escape Hybrid, Explorer, Taurus, and Fusion. A Ford technology that a couple of fleet managers mentioned as impressive, though it takes some getting used to, was the automaker’s Park Assist option. In all, the fleet managers we spoke with came away from the event with positive impressions of Ford's management and its vehicles.